A major renovation of the former home of the Oregonian building at 1320 SW Broadway is about to get underway. 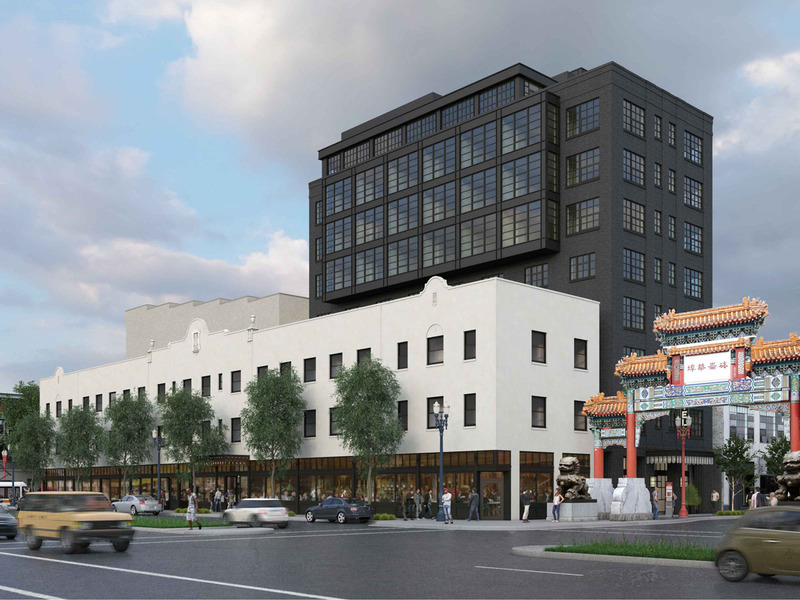 Designs for the remodel have been prepared by architects Allied Works for Seattle based developer Urban Renaissance Group, who bought the building earlier this year. When complete the building will offer 165,000 sq ft of rentable office space, as well as up to 5 new ground floor retail spaces. Parking for 68 cars will be provided, 56 of which will be newly added in the basement. 200 “ride in ride out” bike parking spaces will be provided. Design Advice has been offered to Hacker Architects (formerly known as THA Architecture) for the Field Office on NW Front Ave. The scheme for developer Project^ will include two office buildings, designed to sit in a restored landscape where the architects state that “people are connected to nature at all times”. Together the two buildings will offer 270,000 sq ft of office, ground floor retail and amenity space, as well as underground parking for 221 vehicles. 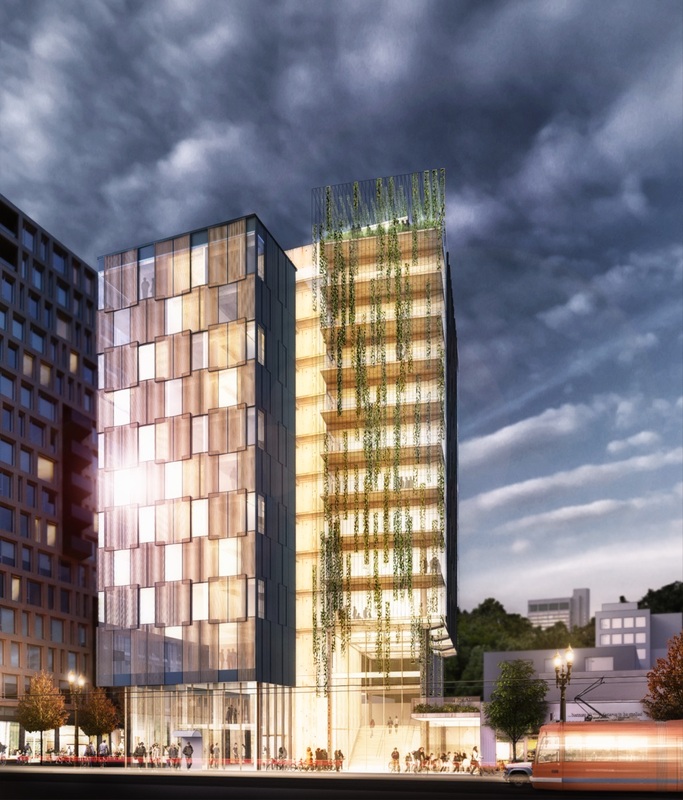 The Oregonian reported that a planned 12 story tall wood building at 430 NW 10th in the Pearl has been awarded a $1.5 million grant by the U.S. Department of Agriculture. The building by Lever Architecture for Beneficial State Bank will utilize Cross Laminated Timber, a structural system that has been proven elsewhere but has been little used in the USA. The USDA grant will help in covering the cost of getting the system approved under the building codes in place in Oregon. Eater PDX reported that Northwest Portland institution Besaw’s will reopen in time for the holidays, at the LL Hawkins apartment building on Conway Block 296. At Portland Architecture Brian Libby looked into the fate of Centennial Mills, and asked whether it will be the next historic landmark in Portland to be demolished. 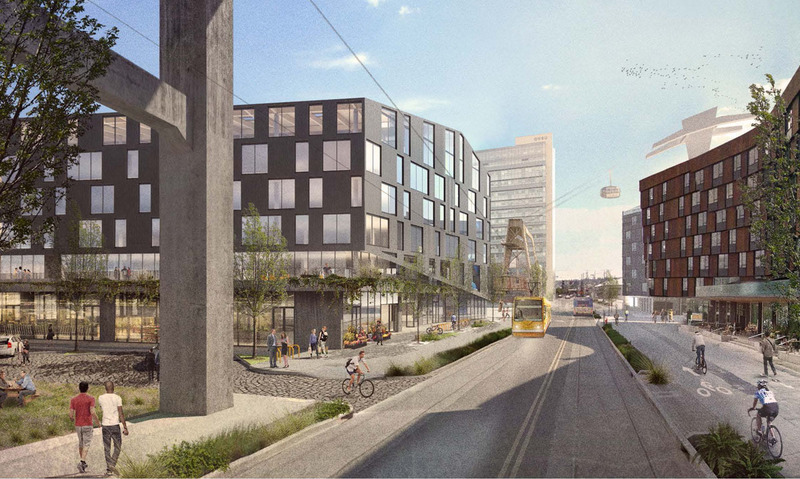 The Portland Business Journal published the first renderings of Zidell Blocks 4 and 6. 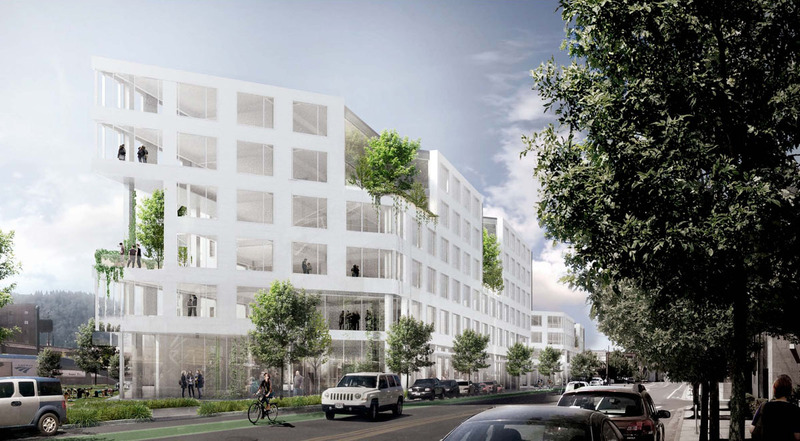 The two office buildings by Lever Architecture / GBD Architects are scheduled to go before the Design Commission for Design Advice this coming Thursday. A major renovation and seismic upgrade is planned for the Towne Storage Building. The Portland Business Journal reported that the project will create over 100,000 sq ft of creative office space. A story in the Portland Mercury noted that 52 existing business and 180 renters with mini storage units will be evicted from the building. 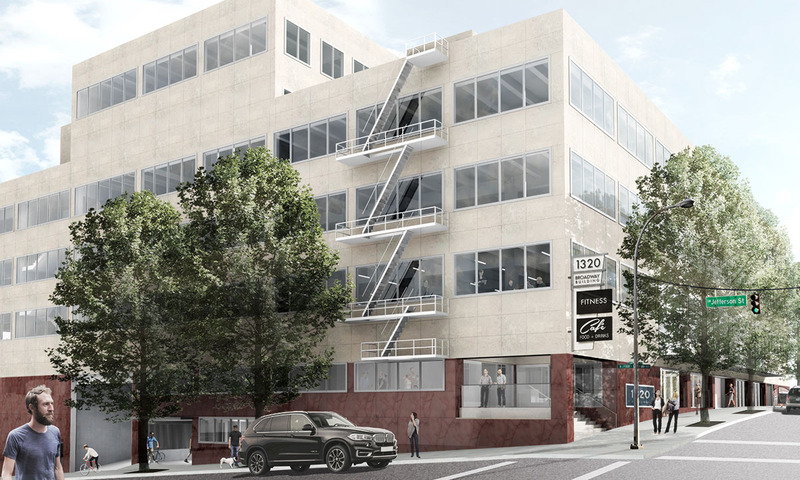 A redevelopment of the former Premier Press building at 1440 Hoyt will add 4 new floors to the building, reported the Portland Business Journal. When complete the project will include 75,000 sq ft of Class A office space. A Design Review hearing for the project is scheduled for October 1st. 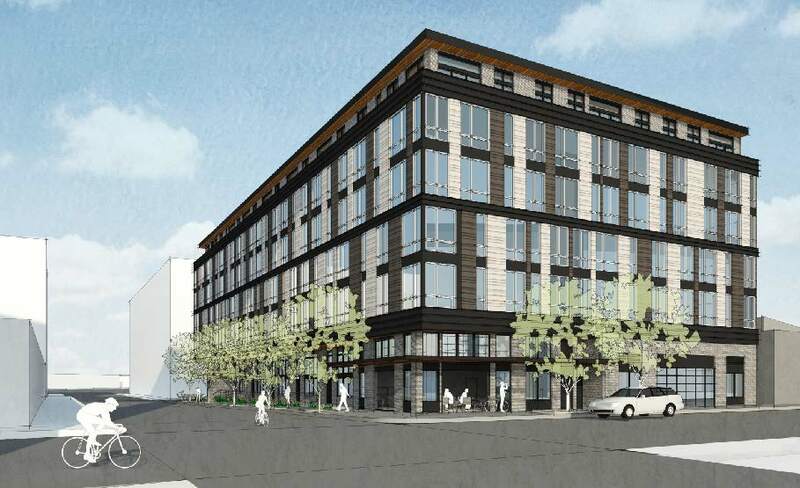 Mayor Hales is “bullish” on plans to buy the Post Office site in the Pearl, reported KOIN. Conceptual ideas for how the site might be developed were recently released as part of the Broadway Corridor Framework Plan. Construction is underway on the remodel of the building formerly home to The Oregonian, originally designed by noted architect Pietro Belluschi. When reopened 1320 Broadway will include areas with ceilings up to 28′ high, reported The Portland Business Journal. The Daily Journal of Commerce published construction photos of Riverscape Lot 8. The Portland Habilitation Center recently completed work on an apartment complex at 17199 SE Division St, reports the Portland Tribune. By keeping costs low, the buildings were built for $65,000 a unit; far below the $200,000 a unit cost typically associated with publicly funded affordable housing. In the article Rob Justus of the PHC asks why the Portland Housing Bureau hasn’t gotten behind their alternative method for delivering affordable housing. A Pre-Application Conference has been scheduled by Ankrom Moisan Architects to discuss a nearly full block development at SW 3rd & Taylor. 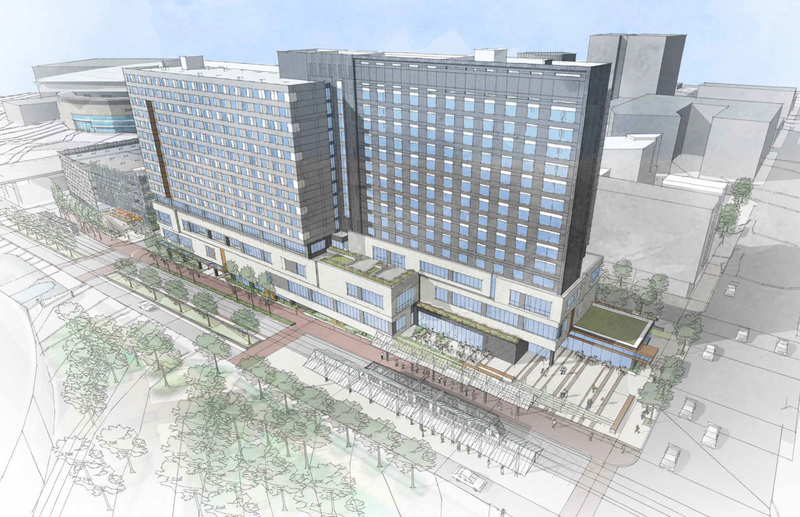 The project would include a new 19-21 story hotel, as well as 100,000 sq ft of office space. 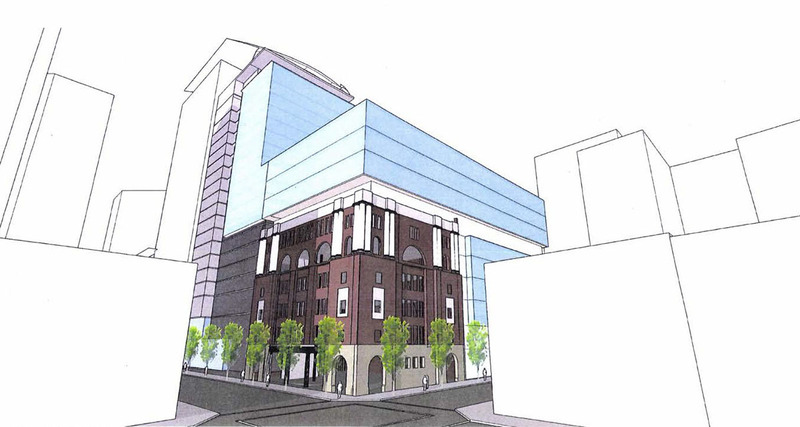 The project would incorporate the Ancient Order Of United Workmen Temple building at SW 2nd & Taylor. Between 43 and 100 parking spaces are proposed, to be accessed from SW 3rd Ave.